Einstein’s general theory of relativity was published in 1915. It again made headlines in 2017 with two major reports about gravitational waves that further confirmed the theory’s last remaining major prediction. 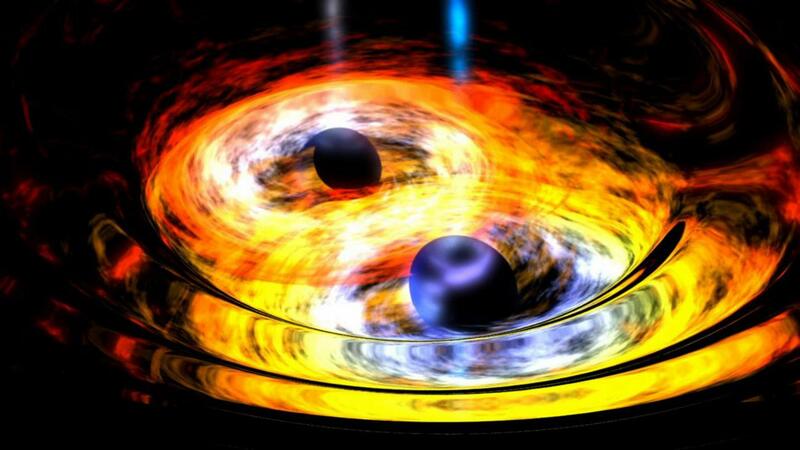 On October 3, the detection of gravitational waves from coalescing black holes was awarded a Nobel Prize. On October 16, the observation of correlated gravitational and electromagnetic (light) waves from the merger of two neutron stars was announced. On August 17, 2017, gravitational waves from the merger of two neutron stars 130 million light-years away were observed for almost two minutes. The directional information from the two LIGO detectors and the Virgo detector made possible the correlation of these gravitational waves with electromagnetic light waves from a galaxy in the constellation Hydra. The seconds-long gamma ray burst of electromagnetic waves was detected by the Fermi Gamma-Ray Space Telescope. Because a neutron star is extremely dense, with a mass similar to that of our Sun but a diameter of only a few miles, a gamma ray burst can contain as much energy as the Sun emits in a trillion years. Dozens of other telescopes tracked the “afterglow” of the explosive neutron star merger at x-ray, ultraviolet, optical, infrared, and radio (electromagnetic light) wavelengths. The results were announced on October 16 and published in a paper with more than a thousand authors, including a Seventh-day Adventist physicist at Andrews University. General relativity theory that predicts and explains gravitational waves describes the non-intuitive laws governing extreme conditions in the Universe at large sizes, energies, and gravitational fields. These extreme conditions result in what appear to humans as cataclysmic events in space and contortions in time. For those interested in the relation of religion to science, they suggest a God who governs the universe in ways that may be beyond our easy comprehension and who has a thousand ways to do things of which we know nothing.